Fantastic performance given by the kops! The live football game (soccer for my American readers) just ended with Liverpool trashing Real Madrid 4 – 0 in the second leg of the UEFA Champions league to seal their place in the last eight of the Champions League. -Liverpool did win on Real Madrid’s grounds 1 : nil – So really, its quite humiliating for the Spanish side (nine-time European Cup winners). I have not watched a football game since long,. (domaining is to blame mainly 🙂 ) and did enjoy this one a lot. At every advertisement break , Heineken , one of the major sponsors of the cup was very prominent . And their hammering of their catch phrase in our minds.. Great Together! Rubbish ads, imho, but Great Together WELL visible. The tournament started in September 2008 and Heineken launched the ‘Great Together’ campaign around that time. Amazing that they bought this name just weeks before, according to the DNJournal sales report for week -Mon, August 18,2008 — Sun. August 24, 2008.
then again… its hard to predict the future use of call-to-action domain names. as for me , I know what is thebestFOOTBALLTEAMintheworld.com .. you’ll never walk alone! This entry was posted on Tuesday, March 10th, 2009 at 11:52 pm and is filed under call to action. You can follow any responses to this entry through the RSS 2.0 feed. You can leave a response, or trackback from your own site. 2 Responses to Great Together. . . The funny thing was that right after I sold it it looked like someone was starting an (in construction) dating site with a logo up brief summary page. Then all of the sudden Heineken owned it within 1-2 months of the sale date. I think someone at the marketing company had a friend purchase it, and then got Heineken to buy for more. Otherwise no one would have gone to the trouble of putting up a dating site logo. Either that or the person that bought it for a dating site got the offer I wish I received from Heineken. 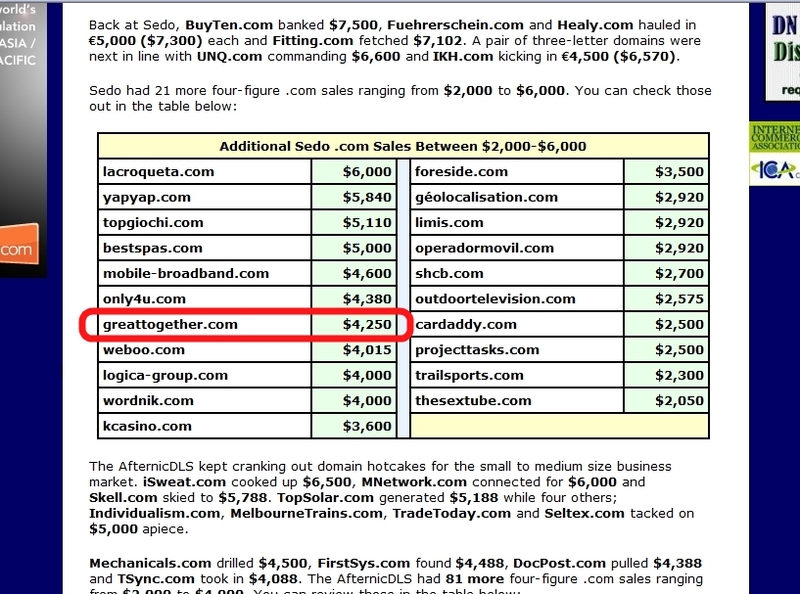 Oh well, it is hard to predict which domains to price high without limiting sales. But I figured this could have resulted in a $10,000-$50,000 sale given the right situation.